You already know that you should be rocking your mailing list and sending them amazing content on a regular basis. But are you? If you liked my review of Tara Gentile’s Email Marketing Kickstart but couldn’t quite invest the money, you’ll love this e-book by Karen, one of our regular guest posters. Karen’s book dives into email marketing from the inside out. She helped me see why I need to email that all important list of fans and how to brand my emails so that they are an extension of my other marketing efforts. Brainstorming takes place during every chapter so I could really digest and put more thought into how I wanted my readers to feel and what I wanted them to see. Karen explained how to insert my voice straight into my emails to give my fans an email they look forward to, click through, interact with, and share. Karen’s book resonates with warmth and familiarity. She’s like your best friend who has some great advice to share over coffee. Her years in business allow her to share the real whys behind having a newsletter. Her book made me realize that my newsletter isn’t about selling, it’s about connecting with my audience. One great tip Karen gave me was the rule of 80/20 – “80% of your content should be about your right people (meeting their needs, capturing their interest, providing them with their entertainment or help), with just 20% being about you and the thing you sell. The marketing plan sheet! At the end, Karen gave me a great marketing plan sheet that helped me identify my brand, purpose, target, content, implement, and timeline for my email marketing. It helped me stay focused in the weeks following reading her book and the additional worksheets aided my brainstorming sessions for future email ideas. 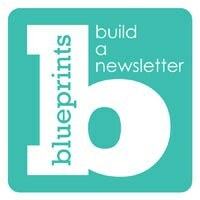 If you’re ready to rock your email list with authenticity, you’ll love Karen’s Blueprints – Build a Newsletter! She really helped me realize the purpose and why behind my email marketing. It’s not about selling; it’s about connecting and sharing! If you’ve enjoyed Karen’s posts here on Create Hype, you’ll absolutely enjoy her new e-book!